On 13 September, following the summer holidays, the vocalist Lenka Dusilová, with the band Secretion, kicks off a tour of Czech clubs and cultural institutions. 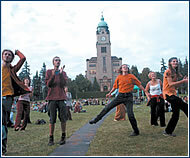 The autumn concerts are a part of this year’s “Light Tour 2003”, with the spring part to take place in May and June. The program will include songs from the singer-songwriter’s new album, First See the Light, which has received rave reviews, as well as her first single, “Don’t Tell Us”, the Last folk compositions, and songs from the Kiss album and from her first solo release. The hits will be played in their classic arrangements, and only the song “Body” will be presented in a new dance-blues version. The concert, against the background of the autumnal, nocturnal sky, will be accompanied by a light show. According to the autobiographical novel Jozova Hanule by Květa Legátová, Petr Jarchovský wrote the screenplay for the new film Želary, directed by Ondřej Trojan, which is now in theaters. The story takes place in the 1940s, the days of the protectorate and the occupation. The heroine, Eliška (Aňa Geislerová) works as a nurse in a municipal hospital and takes part in the resistance. Her group is uncovered and the girl must hide in the wilderness, in a mountain village where time stands still. Želary is a story about the clash of two different worlds and two different human natures. Last but not least, it’s a dramatic tale filled with unexpected turns of fortune that is played out in a God-forsaken place in the center of a war-afflicted Europe. An exhibition of the works of the famous photographer Helmut Newton (1920) will be a major event in the field of photography, enriching the cultural life of Prague in the Autumn. For three months, visitors will be able to view a presentation of 220 works in the fields of fashion, nudes, portraits, and photographic montages. Newton’s contribution to the development of photography in the 20th century lies not only in provocation, but also in intuition, imagination, and receptivity. He often likes to play with combinations of genres and to deceive by passing one style off as another. Prague is the last stop for this unique travelling exhibition that has been enjoyed by viewers in Berlin, Madrid, Moscow, and New York. Indian Summer in the Bohnice psychiatric hospital is an attempt at using music, theater, and graphic art to help remove the barriers between patients and non-patients, and to bring about an atmosphere of tolerance. The 14th annual cultural festival is traditionally filled with music, theater, and amusement for young and old alike. The broad range of musical styles, from blues and rock to reggae and hip-hop, performed by many bands, will be played out on four stages. The psychiatric hospital complex will host theatrical troupes, and it will be possible to take part in chess and “psychological games” and to visit fine arts workshops. The festival will mark the beginning of the nationwide Weeks for Mental Health.